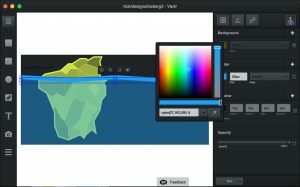 As its name suggests, Vectr is a vector-editing tool that lets you draw shapes, doodle freehand, insert text, and add images to design graphics and prototype interfaces. You can use it right away from the web browser, or with its desktop app (Windows, Mac, Linux, Chromebook) for the fantastic price of free. 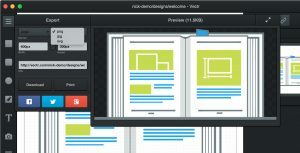 The app sports a dark user interface and is laid out into three main sections: a left sidebar that with panes for layers, pages, dimensions, and the main toolbar; the canvas in the middle; and a right sidebar with style options and file controls. Editing is straightforward and familiar: you pick a function from the left-hand toolbar and draw away. Once the element is created, style options for opacity, shadow, border, and background appear for you to customize. For the background fill, you can choose between a solid color, an image, a linear gradient, and a radial gradient. Gradients use only two color stops, but you can change the orientation using the handles that appear on the object your working on. You can disable these styles using a checkbox beside each one, or by dragging it outside the panel until a tooltip “Remove” appears, at which you can let go. Also while editing an object, a couple of buttons appear right above it that let you flip its orientation or bring its layer position forward or backward. Hover just outside its bounds and it lets you rotate. Resizing is also there of course, but for the rounded rectangles their curves get distorted. This is pretty common behavior for most graphics editors, except those that are also oriented to interface design and prototyping. On the other hand, its stock of custom shapes include a few items that could be useful for wireframing work. The pen tool for creating custom shapes is simple to use. You add one point and then the next, and to draw a curve, hold down and drag. The handles on a curve always mirror each other, so without advanced options it takes a bit of wrangling to get how you want a shape to look like. For text, there’s a wide selection of fonts to choose from, although only being able to scroll is a bit of a hassle. Like the other object types, text can have custom fills, shadows, and borders. There’s no “hand” tool to drag the canvas around, but you can scroll vertically and horizontally. There are no visible buttons for other standard actions like undo, redo, or paste, but they are available in a right-click menu, or through the built-in system keyboard shortcuts. One important thing to remember especially while using the web app is to log in or create an account so you can save your work. Once done, you can either print, download, copy the link, or share on Facebook and Twitter. If you decide to make further changes, your friends can actually see you make them as it happens. 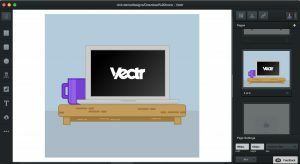 If you’re looking to a quick, lightweight way to create designs or spruce up some photos, Vectr can be a great choice for you.